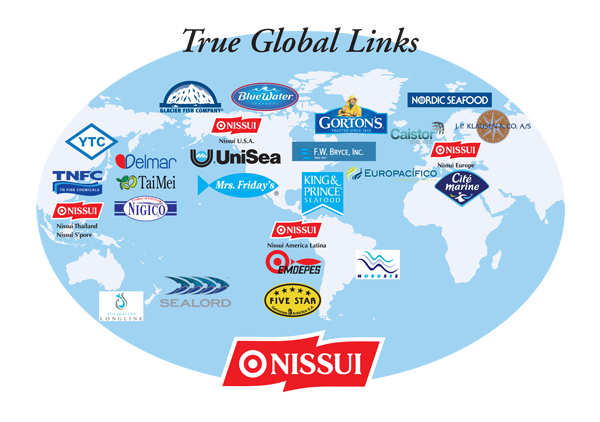 Nordic Seafood A/S is a member of a unique global network: True Global Links. The core owner of this group is NISSUI, who has established a "True Global Link" as the largest global supply chain for seafood. Nordic Seafood hold leading positions in the network together with a number of other major companies throughout the world. True Global Link is an expression of a wish to combine the wealth of the oceans with scientific development and human values in a responsible utilization of resources for the benefit of the people of the world and with respect for future generations. The thoughts behind True Global Link are in harmony with Nordic Seafood’s long-standing basic values: the distribution of top-quality products based on ethical principles. This involves respect for the environment and reliability in cooperation with customers.